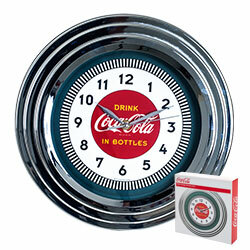 Bring the unique style of the world?s most recognizable brand home with this incredible Coca-Cola clock. This retro clock features a 1930s style Coca-Cola design and the high gloss chrome molded case adds a brilliant shine to the clock. Make a spectacular addition to your kitchen, den or game room with this amazing clock.